As the user enters scores and the cursor moves to a new cell, our system saves a draft of these scores. In case the computer crashes or some other issue occurs before the user can click one of the Save buttons, the scores can still be recovered. This is called Auto Recovery and Timeout Protection. Additionally, if someone gains access to the Gradebook and makes changes, it is possible to restore grades to the previously saved version. A history of all scores in the Gradebook is also being stored. A built-in timeout protection system saves the users' work as they enter scores in the Gradebook. This allows them to return to that page in case they leave or in case their system times out for various reasons. If the user leaves the page or if the page suddenly times out, they will be shown a page that says that their work is saved and will become available again when they log back in. 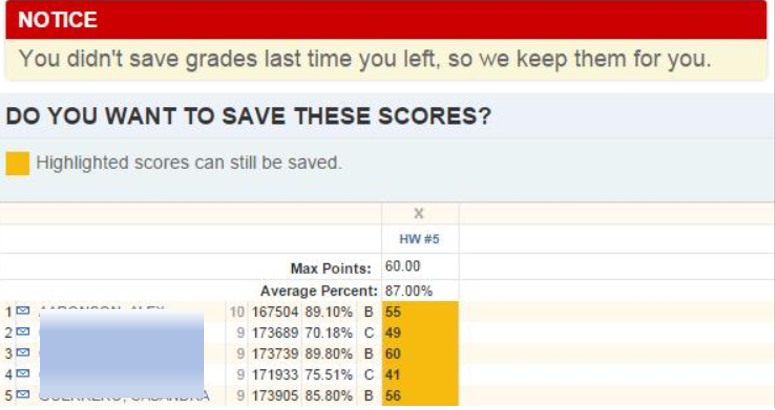 If the scores were entered but not saved, the users will still be presented with the unsaved grades. At that point, they can choose to either save or delete the unsaved grades. Unsaved grades are marked orange as pictured above. Please note that scores are saved every 30 seconds, which should cover most circumstances in which scores would have been entered but not saved. However, clicking the Save button once every minute or two when inputting grades still represents the best defense against lost grades.